Who says you can’t have chocolate for breakfast? 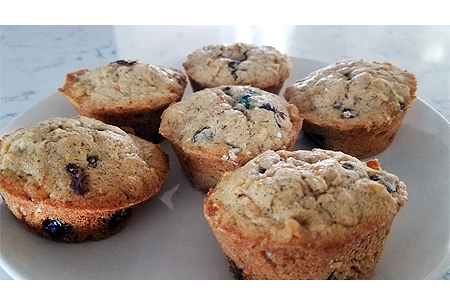 These Chocolate Chip Muffins have healthy carbs from whole wheat flour and oatmeal, contain fruits (apple), veggies (carrots) and mood & brain-boosting healthy fats from flax seed. I’ve made a batch of these on a Sunday night to help prep for the week and then serve it for breakfast with a cup of tea or smoothie. It is also great as an afternoon snack. Lightly coat muffin pan with cooking spray. In mixing bowl, combine baking soda, baking powder, flour, chocolate chips, shredded apple, shredded carrots and flax seed meal. In another bowl, combine butter or oil, eggs, vanilla and sugar. Add butter mixture to dry ingredients and mix. Spoon into prepared muffin pan, filling each cup 3/4 full.